On Monday June 22nd we are organising a one day symposium entitled “The Internet at 100”. 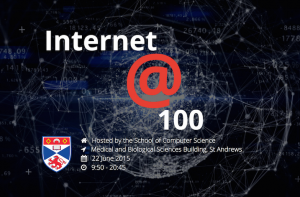 This event features a host of distinguished speakers and culminates with a talk by Dr Cerf, one of the “fathers of the internet” and now vice-president and chief internet evangelist at Google. The Internet is, of course, not 100 years old. It’s not even quite 50 years old but the talks at this event will look at its history, its current state and forward to what it might look like at 100. We are looking forward to a day of inspiring talks, time to network and socialise but also time to look back while we consider what might be for the Internet.